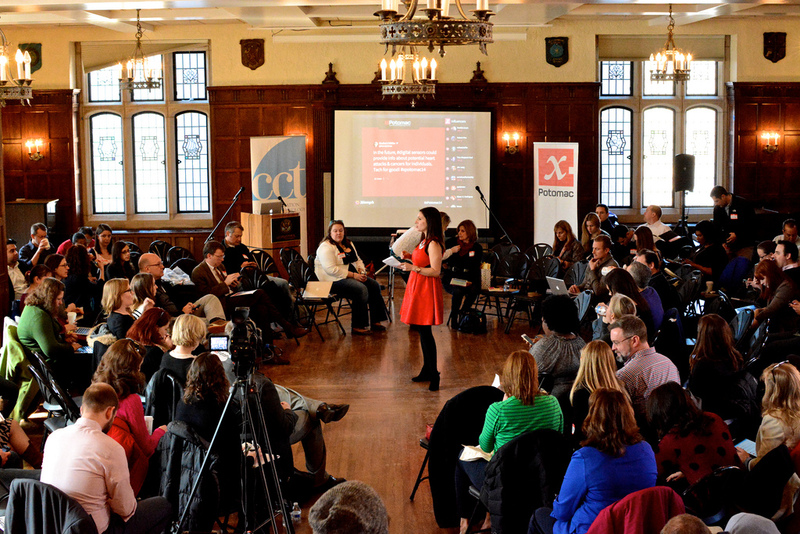 xPotomac 2014 or #xPotomac14 was held last Friday at Georgetown University’s Copley Formal Lounge. Speakers include keynotes Robert Scoble, Jim Long, and session leaders Lauren Vargas, Toby Bloomberg, Peter Corbett, and Allyson Kapin and Danielle Brigida. As you can see, people tweeted about the content throughout the conference. And tweet they did. xPotomac trended for 35 minutes on Friday making it the 68th most popular topic in the country that day, according to Trendinalia United States. Official xPotomac influence partner Zoomph tallied more than 3100 tweets and Instagram updates with a reach of more than 20 million people were posted last week and through the weekend. Not bad for 100 people coming together for a few conversations. The above Zoomph word cloud shows the 50 most referenced words in all those tweets. Who was the greatest influencer of them all? Tinu Abayomi-Paul rocked her smartphone and took the prize, says Zoomph. Most folks said they had a lot of fun (including emcee Shana Glickfield, who photo bombed me), and enjoyed the conference more than last year’s. Further, it seems we’ve transcended the increasinly distant BlogPotomac series that served as a foundation for the current xPotomac. Co-founders Patrick Ashamalla (above), Shonali Burke and myself will bring xPotomac back next year at the Copley Formal Lounge thanks to our relationshiop with Georgetown’s Communications, Culture and Technology program. Look for more great speakers like Robert, Jim, Danielle and Allyson (pictured below), Toby, Peter and Lauren. In the interim, you can see all my photos from the event here. And we will roll out videos of the individual speaker sessions over the next month or so. Thank you to everyone — attendee, sponsor and of course, our speakers — who made xPotomac happen. What did you think of #xPotomac14? P.S. Since publishing, Brian Conlin published his “Six Brain-Bending Ideas from xPotomac 2014” on the Vocus blog. Check it out.